Bike sharing programs are cropping up across the world, although the concept is in its infancy in the vast majority of countries. However, Indore, a city located in central India, has been spearheading the idea for almost a quarter century. Stationed near impoverished areas and hubs for public transportation, Indore’s bicycle rental stores are utilized by the working class. The system has come a long way in a relatively short period of time, although there is still much to be done to expand the current system. 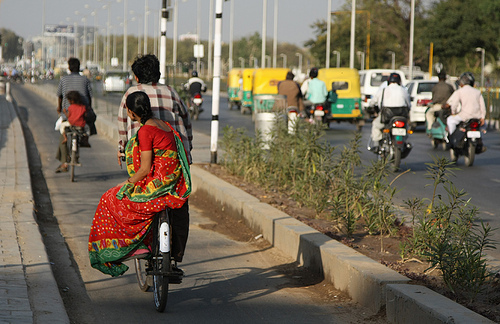 Currently, the bicycles are just utilized by certain people in Indore. Many shop owners only feel comfortable allowing those that they either know, or that they have a personal connection to through friends, to borrow their bikes. As a result, access to this mode of transportation is limited across the city. By creating a formal structure for the program, more citizens can be involved and more bikes will be available for use. The Atal Indore City Transport Service Co. Ltd. recognizes the potential for the program and hopes to build on the structure that is already in place. One of the largest problems with the current program is that bikers must return their cycles to the store where they originally got it from. This makes it hard on people who do not want to take the bicycles very far. In addition, in order to open the program up to more users, Indore will need to think about how they can make their roads more bicycle friendly and where their citizens would be able to park their bikes when they are not using them. The system that is in place does have its benefits, however. Shop owners make a nice sum of money on each of their bikes and are able to get additional work fixing issues that crop up with bicycles across the city. On average, every 60 bicycles that are available for rent results in the employment of two people. Other countries can benefit by examining what Indore has done and adapting their system to their own needs. Cycling is becoming increasingly popular throughout the world, due in part to the fact that bikes are relatively inexpensive to produce and maintain. Help spread the word and encourage others to take advantage of everything that bicycles have to offer. Make others aware of how cycling can improve their health, minimize greenhouse gases and relieve congestion on crowded roadways.